Elasund? the little settlement on the coast? Well, those days are long gone. 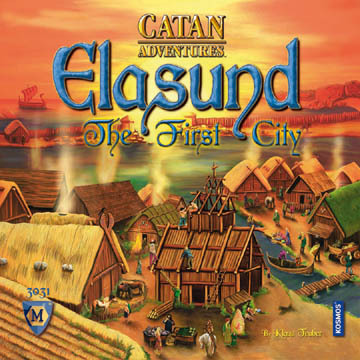 Elasund is growing rapidly and Catanians are streaming into the city, eager to make a fortune! You are appointed to help the city develop. You heed the call to drive the cityâ€™s growth and prosperity. Hire workers, acquire building materials. What will your next build be? The competition is eager to excell and claim all of the credit! Limited resources early on will limit players to a few small buildings. Your influential connections will provide you with all the necessary building permits. In Elasund, nothing works without building permits! Once buildings are constructed, they can generate either gold or influence for you. Soon you can start going after bigger projects! Soon enough you may become involved in grander projects, such as building the church or the city walls. If you donâ€™t watch them closely enough, they might attempt a hostile takeover of your buildings! Will you emerge as Elasundâ€™s savviest and most influential city developer? Find out in this new Catan adventure!